Rides a Bike launched on Thanksgiving Day, 2010 — a photo blog designed to showcase and celebrate two big passions of mine: cycling and cinema. The vast majority of photographs that you see are from my personal archive of original Hollywood studio stills, from the files of long-gone movie fan magazines and defunct wire services. These are not “aggregated” images glommed from other websites, but scans from more than 1,600-plus photos that I’ve collected– and continue to collect. 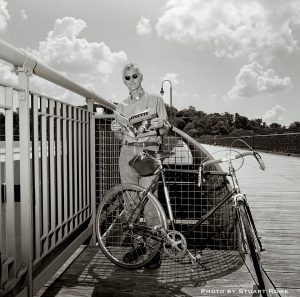 If you’re looking for a picture of your favorite star, or a great character actor, a forgotten ingenue, a silent screen legend or Hollywood bombshell astride a cool old bicycle, you’ve come to the right place. Many of these images are available for licensing for book, magazine and web publication. Quite a few, too, can be ordered as gallery-quality oversize prints.